To complement the Clinical Guidelines and Demand Management Plan, support long-term planning, and provide data on the use of immunoglobulin in rare disorders, the National Immunoglobulin Database has been developed. The Immunoglobulin Database is hosted on the N3 network and is managed by MDSAS. NHS network connection is required to access the Immunoglobulin Database. Nominate a validator (typically the Chief Pharmacist) to ensure only authorised individuals have access to the database and send this information to MDSAS. Ensure that all new patients initiated on immunoglobulin are registered on the database and usage information is entered on a regular basis. 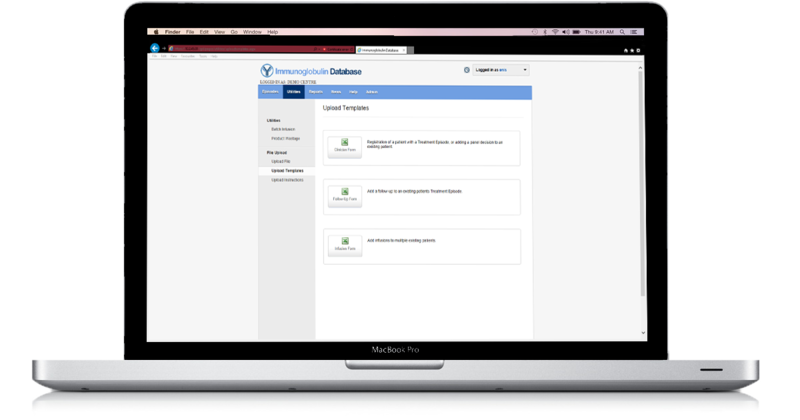 Ensure that all existing long-term immunology and neurology patients are registered on the database as they attend the Trust for infusions or their annual review. Registration and all immunoglobulin usage information must be entered. Communicate to all pharmacists and clinicians within the Trust, the information that will need to be collected/supplied in order to successfully and accurately populate the database. Ensure that immunoglobulin usage and entry into the database is audited. The DH will run compliance reports on a regular basis. There are three electronic forms available under the utilities area of the database, patient registration, follow-up, and infusions. The forms are available under the utilities area of the database, and we recommend all trusts download these forms to consider the best way to collect the information required through their normal patient pathway/process. The database provides a facility to upload the information contained within the forms, and automatically update the patients record. Firstly head to the database and login with your username and password. Once logged you will need to click the utilities button which is located on the top bar. On the left hand side you will find a sidebar click ‘Upload templates’ to download the forms you need. The Department of Health has published a National Immunoglobulin Database Update. This update document describes initial findings from the Database on immunoglobulin prescribing patterns, includes information on the forthcoming Model Commissioning Policy for immunoglobulin and offers a summary of the updated guidance on the use of immunoglobulin for measles post-exposure prophylaxis issued by the Health Protection Agency. This document can be viewed by clicking the button below.